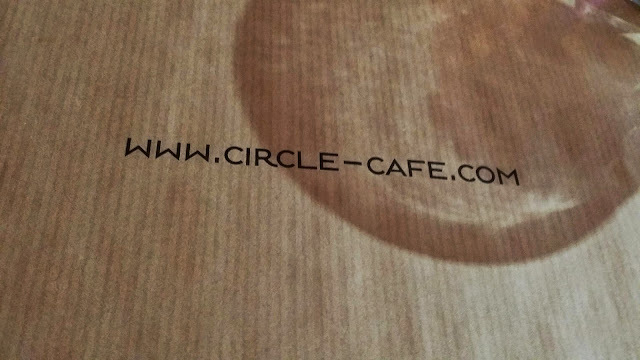 Circle Café has proudly joined the re-invention club and launched a new menu recently and I'm going to give you a low down on how well they scored. Tucked away into the quite Business Bay square in downtown Dubai, Circle Café is a cosy hidden gem. 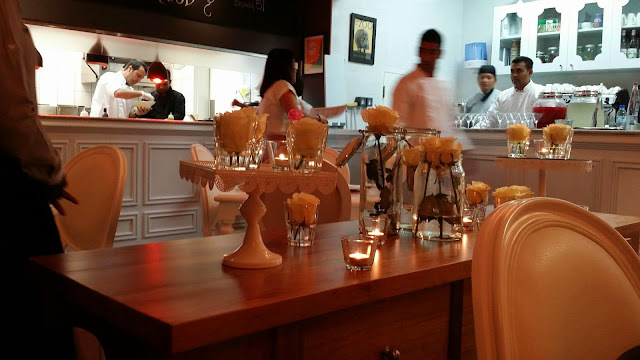 The simple and elegant interiors give a very relaxed home feel which makes the food more enjoyable. Let's get down to business then..First up were the Bagel chips. 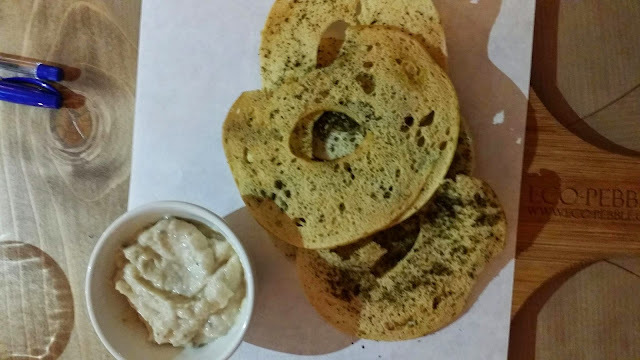 As the name suggests they were thinly sliced baked Bagel chips served with a Tarama Truffle dip. From the first bite I knew this dish was going to be in my top three for the night. They were so crisp and light that I couldn't stop munching. The zatar type seasoning gave it the perfect amount of subtle flavour. 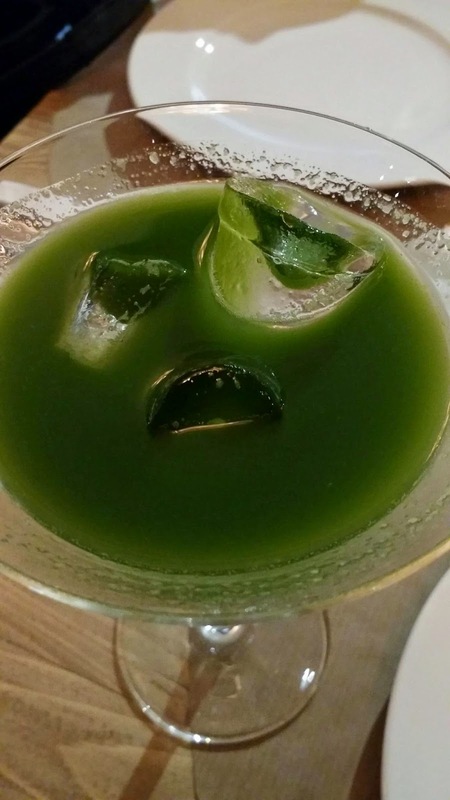 For those with a preference for stronger taste, the dipping sauce gives it a unexpected punch which grows on you with every bite. 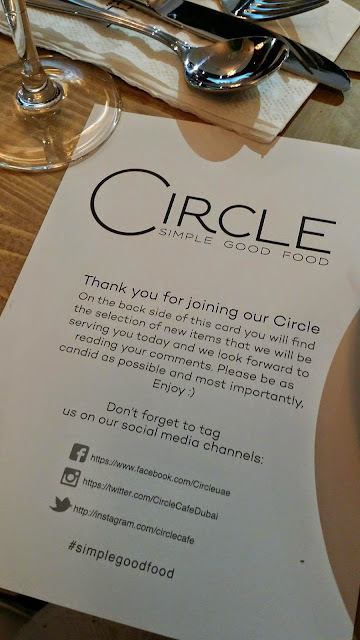 Next was the Whole Wheat Salmon Pasta followed by the Circle Greek Salad, both of which are healthy options but low on the seasoning aspect for me. I found the pasta bland. 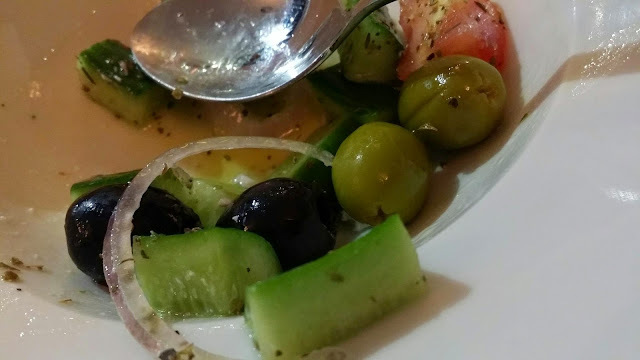 The salad on the other hand was quite fresh but it would have been better with some more cheese. 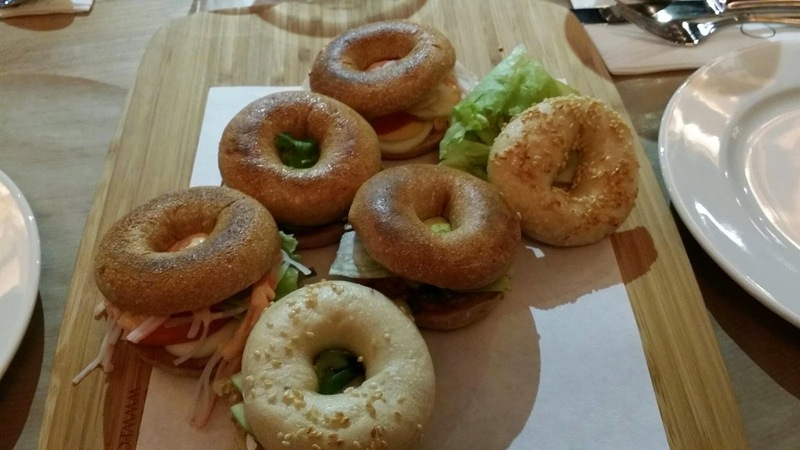 A surprise addition to the evening was the assortment of Bagel sandwiches which were not mentioned on the menu. Out of the Brie, Mexican Veggie and crab, the brie paired with apple, walnuts, basil and pesto won my vote. An interesting combination of veggies and sauces made these sandwiches the perfect savoury packed bites. 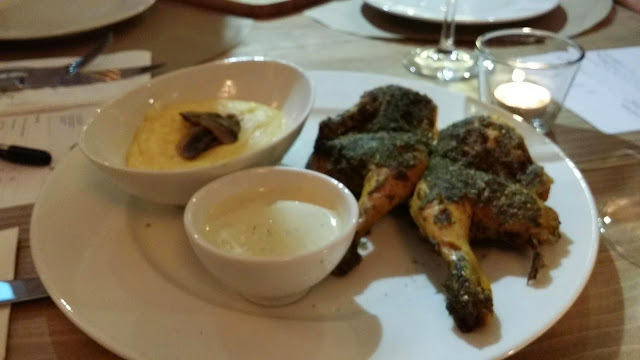 In the mains I tried the Corn Fed Baby Chicken, some Circle Lamb Kofta with Polenta, Vegetable Couscous and Risotto on the side. The chicken sprinkled with herbs was appealing to the palette but a bit dry on the inside which reduced the overall quality of the dish. The lamb kofta was soft and moist, served with a yogurt chutney (just the way I like it!). I'm not a big fan of couscous but people around me were loving it. The risotto was rich and creamy but not as nearly wonderful as the polenta. Termed as the perfect "comfort food" by a fellow foodie it really bought home the trophy. I couldn't get enough of the polenta which at first I mistook for something similar to mashed potatoes but found out that it is actually an Italian dish made of cornmeal. Then came the best part of the evening which as you can guess was DESSERT! And what better way to win my heart than chocolate. The chocolate tart was the right amount of dark, something that I could easily OD on. 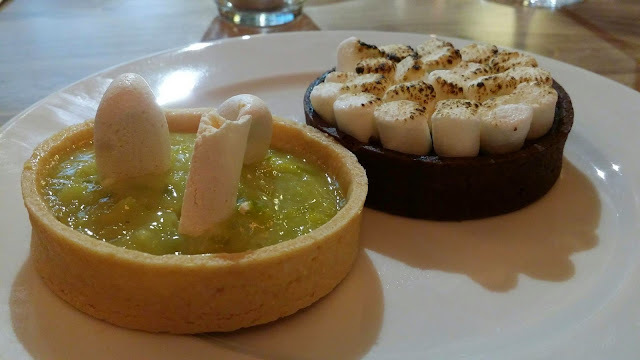 The lemon tart was sour and lemony as one would expect, perfect for those who don't like chocolate (as hard as it is to believe, this rare species does exist!). The tart crust was easy to break into which is always good (who likes a crust that ends up breaking your fork!). The cherry on the top here was the meringue bits, they looked odd just standing there, but by far are one of the best ones I've ever had! They just dissolved in my mouth and the tasted soo good (I want some now)! 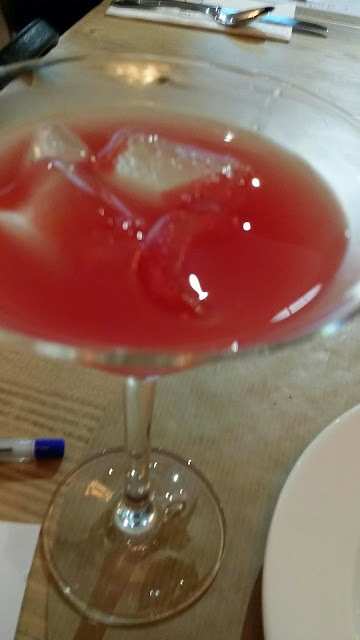 And thus the night came to an end, with good food and interesting conversations. As for my rating, I give it three and a half stars and recommend that you definitely add Circle on your must eat places this month. I tried their Chicken Skewers and Grande Crepe for dessert! Oh I must say it's all worth it!